I recently reviewed The Sound of Music, the Best Picture winner of 1965. It is an amazing icon of the cinema, a musical extravaganza that hasn’t lost a beat in 50 years, a timeless classic. It combines a great actress with a great play, rounds out the cast, and buries us in magical songs. 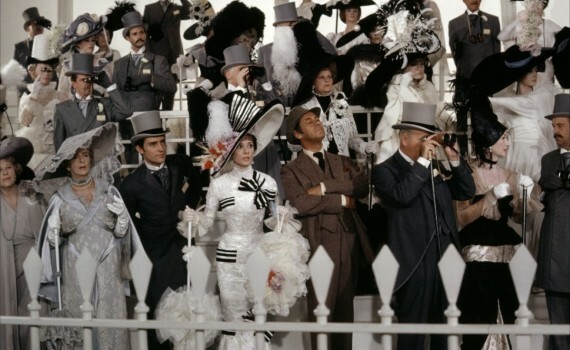 Going back one year, My Fair Lady was the Academy Award winner for Best Picture of 1964, nominated for 12 Oscars in all, winning 8 of them. In comparison, The Sound of Music was nominated for 10, won 5. So these two musical giants won back-to-back Best Pictures, dominated the nominations, and are still revered as pillars of modern film. But I have to imagine that the committee gave themselves a collection facepalm after seeing The Sound of Music, a movie that is superior to My Fair Lady in every possible way. The latter tried to do what the former succeeded in, and unless you already have a childhood love for this film, I can’t recommend that anyone watch it. Eliza Doolittle is a common London street urchin, a gutter snipe, a seller of flowers, a rough girl, and she can barely speak a word of intelligible King’s English. When a wealthy aristocrat named Professor Henry Higgins hears her atrocious accent, he brushes her aside as a worthless piece of trash that will never rise above her station. But when a fellow linguist challenges Higgins with a bet, the cocky bloke can’t refuse. In six months, Henry will take Eliza to a royal ball where he will attempt to pass her off as a high-born lady. If he can change her speech, he thinks he can change her persona, proving that he is a god among men. But Henry forgets that Eliza is a woman first, an emotional creature, and that she won’t be brushed aside as a simple experiment. I was shocked that this movie was so terrible. I knew I hadn’t liked it when I tried to watch it as a kid, my mom & sister always playing the classics but 10-year-old me having trouble getting into them. But I assumed I would enjoy it now, the way I have so many classics: The Sound of Music, Singin’ in the Rain, Casablanca, Breakfast at Tiffany’s. Unfortunately, I did not, and I don’t understand who could. Audrey Hepburn was appallingly bad, terrible, just horrendous. Her annoying & obviously fake voices, her repetition of catchphrases (I’m a good girl, I am! ), her lip synching through songs performed by another woman; embarrassing. The movie itself was so slow, had very few quality songs, and could not be saved by a solid Rex Harrison. That this film won Best Picture right before The Sound of Music won the same award is a joke, the two not residing in anywhere near the same categories.